A gripping sf adventure from the acclaimed author of The Pliocene Exile series. A gripping sf adventure from the acclaimed author of The Pliocene Exile series. Two hundred years into the future, the great corporations of Earth dominate all life in our Galaxy. But their endless pursuit of wealth and power has opened the door to a malevolent alien race, intent on engulfing the Commonwealth of Human Worlds. Rampart Starcorp has achieved an unprecedented David versus Goliath court victory against rivals Galapharma, making them the most powerful clan in the Commonwealth Worlds. Life should be good... But Helly still believes there's a dangerous lie hidden behind the Haluk ambassador's declaration of peace and friendship, and with Galapharma's insane boss, Alistair Drummond, missing presumed dead, Helly can continue his search for evidence of a planned invasion. The investigation leads him to Phlegethon, the sleaziest smuggler port in the universe, in search of information from the only man ever to return from the Haluk worlds alive. But the price of this crucial lead will be very high indeed. Discovering too late that no one is who they seem, and trusted friends may be deadly enemies, Helly finds himself alienated and on the run. With time running out, it appears there is nothing he can do to prevent the Haluk invasion of Earth. 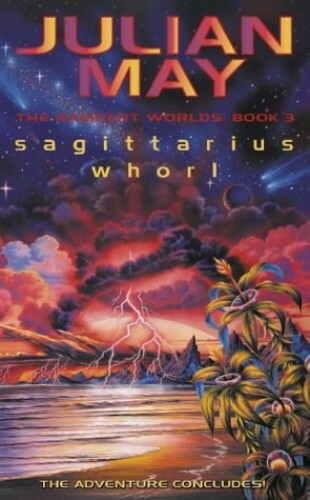 Sagittarius Whorl is an adrenalin-fuelled adventure full of high-speed thrills, intrigue and sharp-edged humour, which delivers an entertaining and compelling finale to the Rampart Worlds trilogy.